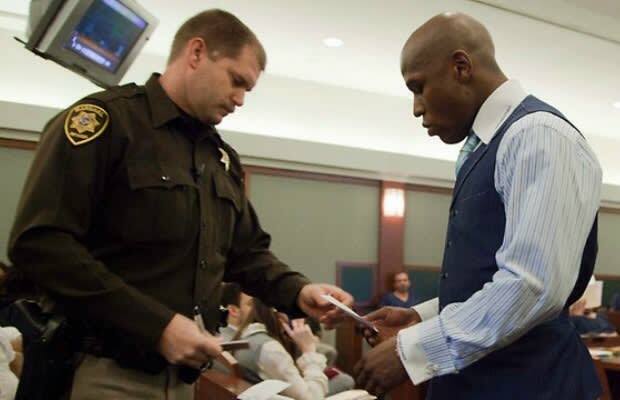 Tomorrow, Floyd Mayweather, Jr. is due to report to a Las Vegas county jail to begin serving his 90-day sentence. The jail term stems from the boxer's assault of his ex-girlfriend in front of their children. While the current WBA (Super) light middleweight champ seemingly had no problems confronting the mother of his children, some critics have called him out for ducking a potential super fight with Manny Pacquaio. There's no saying if that bout will ever go down, but there's no doubt that Money May will have plenty of time to think things over. But Mayweather is far from the first boxer to have a stint behind bars.